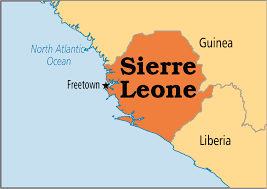 The much anticipated National Youths Service Scheme in Sierra Leone will commence this October, an official disclosed on Tuesday. Minister of Youths Affairs, Mohamed Orman Bangura, said the scheme will start with 200 youths who will be deployed across the country to provide national services in strategic development areas. The scheme, which was initiated under the last administration of Ernest Bai Koroma, is geared towards creating training and employment for young people in a country with one of the highest rates of unemployment. But like many initiatives hatched under the former government, this initiative had been shrouded in controversies, which has been blamed for the delay in its commencement. The new Youth minister promised to depoliticize the scheme, saying as a new government they believed development issues can’t be politicized. According to the ministry, over 1000 youths applied for enrolment into the scheme. But Minister Bangura said they couldn’t take many people as a start for easy and effective coordination. He said successful applicants were drawn from all parts of the country to reflect their ethnic and cultural diversity of the nation. The National Youth Service Scheme is modeled on the Nigerian version of the scheme.